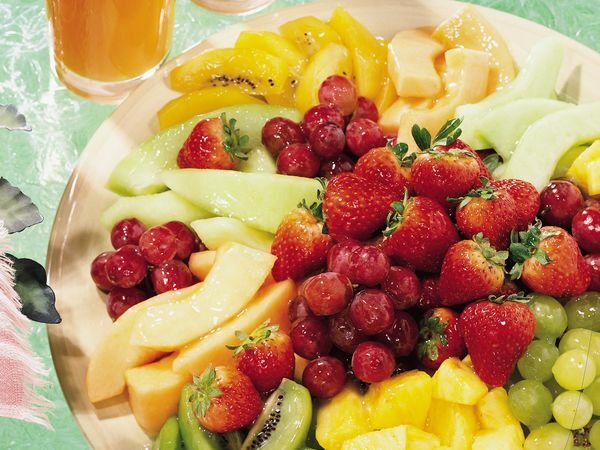 Arrange fruit on large serving tray. If desired, cover and refrigerate. In small saucepan, combine water, mint, honey and cornstarch; mix well. Cook and stir over medium heat until mixture boils and thickens slightly. Cool 10 minutes. Remove mint leaves with fork or slotted spoon. Stir in lemon juice. Serve immediately, or cover and refrigerate until serving time. Just before serving, drizzle glaze over fruit. If desired, garnish with additional mint.